Read Will Birch’s No Sleep Till Canvey Island; The Great Pub Rock Revolution and you’ll understand that Brinsley Schwarz (the band and the man) were at the forefront of the pub rock movement. Pub Rock arguably gave birth to punk as well has having spawned some of the 80’s and 90’s greatest pop artists (The Records, Nick Lowe, Elvis Costello, and Graham Parker just to name a few). Brinsley Schwarz (the man) was there from day one of Famepushers to the bitter end with Dave Robinson, who would move on to found Stiff Records with Jake Riveira. While Nick Lowe and Ian Gomm may have been the main songwriters in the band back in the day, with Unexpected we’re treated to Brinsley Schwarz’s originals from start to finish. In No Sleep (more on the book later), Birch makes mention of the fact that near the end of the band’s musical life, Schwarz had become disenchanted with the direction they were going – away from the country tinged sound and toward a more poppy sound. One of the band’s main influences was Robbie Robertson’s The Band, and both Lowe and Gomm could see that wasn’t where the industry was headed. With unexpected, Schwarz goes right back to that country tinged sound he prefers. The opening track, “Just Surrendering”, is smooth and tuneful and would have fit nicely on almost any of the Brinsley Schwarz (the band, again) albums. “You Miss Again” is another winner and sounds almost as if Graham Parker wrote it. But he didn’t. Other highlights include “Beautiful Loser”, “Waking The Dead” and “Looking Here to Stay”. Bottom line: there’s plenty here to like, whether you’re an old fan or a new one. If you’re a fan of the Stiff Records period and before, Brinsley Schwarz’ Unexpected is an unexpected surprise and a must for your music collection. 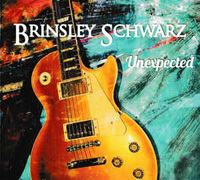 Get your copy of Brinsley Schwarz’ Unexpected at Kool Kat Musik.